Open information extraction approaches are useful but insufficient alone for populating the Web with machine readable information as their results are not directly linkable to, and immediately reusable from, other Linked Data sources. This work proposes a novel Open Knowledge Extraction approach that performs unsupervised, open domain, and abstractive knowledge extraction from text for producing directly usable machine readable information. The method is based on the hypothesis that hyperlinks (either created by humans or knowledge extraction tools) provide a pragmatic trace of semantic relations between two entities, and that such semantic relations, their subjects and objects, can be revealed by processing their linguistic traces (i.e. 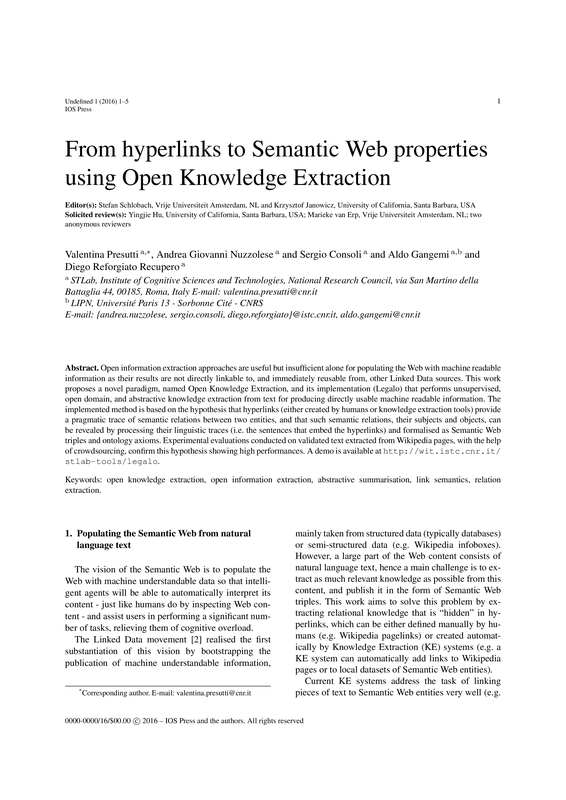 the sentences that embed the hyperlinks) and formalised as Semantic Web triples and ontology axioms. Experimental evaluations conducted with the help of crowdsourcing confirm this hypothesis showing very high performances. A demo of Open Knowledge Extraction at http://wit.istc.cnr.it/stlab-tools/legalo.